GRANDIN, VITAL-JUSTIN (named Justin-Vital at birth), Roman Catholic priest, Oblate of Mary Immaculate, and bishop; b. 8 Feb. 1829 in Saint-Pierre-la-Cour, France, son of Jean Grandin and Marie Velliard, hotel-keepers and farmers; d. 3 June 1902 in St Albert (Alta). 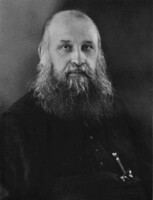 From an early age Vital-Justin Grandin felt a religious vocation, and in 1846 he entered the Petit Séminaire de Précigné with the intention of becoming a parish priest. In 1850 he decided to be a missionary and, despite a pronounced lisp, ill health, and incomplete studies, he entered the Grand Séminaire du Mans. The following year, in anticipation of serving in the Orient, he sought admission to the Séminaire des Missions Étrangères in Paris but he was not admitted because his speech impediment was deemed too great a handicap. He then approached the Oblates of Mary Immaculate and on 28 Dec. 1851 entered their noviciate at Notre-Dame-de-l’Osier. Grandin took his religious vows on 1 Jan. 1853 and was ordained on 23 April 1854 by the founder of the Oblates, Bishop Charles-Joseph-Eugène de Mazenod. In May that year Mazenod decided to send Grandin to northwest America because he was the only individual volunteering to serve there. Grandin arrived in St Boniface (Man.) in 1854 and was assigned to La Nativité mission at Fort Chipewyan (Alta) the following year. Like the French Oblates such as Pierre-Henri Grollier* who preceded him, Grandin had received no specialized preparation in the seminary for work among native populations, and he had to acquire this knowledge and develop his linguistic skills in the field. In September 1857 Grandin left Fort Chipewyan and went to a new posting at Île-à-la-Crosse (Sask. ), where he adopted two young orphans. His hope was to educate them and thus establish the foundations for a native clergy. The year before, Bishop Alexandre-Antonin Taché* of St Boniface had made representations to obtain the appointment of a coadjutor bishop with right of succession for his diocese. On 11 Dec. 1857 Pope Pius IX signed the bulls naming Grandin bishop of Satala in partibus infidelium and coadjutor bishop of St Boniface with residence at Île-à-la-Crosse. Grandin was consecrated in Marseilles on 30 Nov. 1859 by Bishop Mazenod and chose as his motto, Infirma mundi elegit Deus (“God hath chosen the weak things of the world”). Upon his return to Île-à-la-Crosse Grandin was visited by Taché and they discussed a proposal to erect a new vicariate with a resident bishop in the Mackenzie River basin as a means of countering the success of Anglicans in that region. Pending the appointment of someone, Grandin undertook an extensive tour of the northern missions, beginning in June 1861, in order to lay the groundwork for the future vicariate. It was on this journey that he selected the strategic site for Providence mission (Fort Providence, N.W.T.) and suggested that the new bishop should reside there. Grandin also visited the stations at forts Simpson, Liard, Good Hope, Norman, and Rae (Old Fort Rae) before returning to Île-la-Crosse in August 1864. During this long voyage Grandin was troubled by the prospect of receiving the episcopal appointment. Despite having the support of northern missionaries Grandin, characteristically timid and hesitant, presented objections to his candidacy, claiming that his colleague Henri Faraud* was better qualified. Upon returning to Île-à-la-Crosse he was relieved to hear that Faraud had been named vicar apostolic of Athabasca-Mackenzie on 13 May 1862. One of the practical difficulties confronting the missionary effort was the problem of supplies. While at Île-à-la-Crosse Grandin sought to establish a route from St Boniface that would reduce his dependence on the Hudson’s Bay Company monopoly of transportation and imported provisions. To ensure adequate supplies for the northern missions Taché proposed that jurisdiction over the Notre-Dame-des-Victoires mission at Lac la Biche (Alta) should be transferred from the diocese of St Boniface to the Athabasca-Mackenzie vicariate. The change would facilitate the use of the mission as a centre of provision and trans-shipment for the north, and initially Grandin supported the idea. He and Faraud signed an accord effecting it at Île-à-la-Crosse on 19 June 1869. In the meantime, Grandin had accompanied Taché to Rome and then to France to attend the 1867 general chapter of the congregation. Taché proposed a division of his vast diocese and the superior general responded by creating the vicariate of Saskatchewan on 20 March 1868. Grandin was given charge of it as vicar of missions. 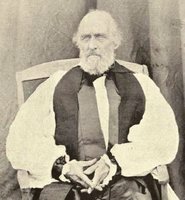 At Taché’s request Grandin attended the council of Quebec bishops in 1868 which discussed the reorganization of ecclesiastical boundaries in Canada. It recommended that Rome elevate St Boniface to a metropolitan see and create St Albert as a suffragan diocese. On 22 Sept. 1871 Rome issued the bulls creating the diocese of St Albert and appointing Grandin its bishop. 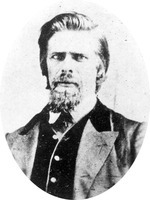 As Grandin’s status within the hierarchy changed, he began to question the wisdom of the accord he had signed with Faraud relative to the Lac la Biche mission, and he made his grievances known to the superior general in 1874. Despite the formulation of a new convention by the superior general the disagreement between Grandin and Faraud was not resolved and it became so acrimonious that it threatened to paralyse Oblate missionary efforts in the north. Consequently, in 1877 the superior general conferred special powers on Taché to settle the contentious issues of jurisdiction and financial responsibility. As a result of Taché’s mediation the difficulties were overcome; later, in 1890, the mission reverted to Grandin’s jurisdiction since it was no longer needed as a supply depot. Shortly after taking charge of his diocese, Grandin became convinced that attempts to “civilize” and evangelize native adults would have negligible results and that it would be preferable to concentrate on weaning children from their traditional lifestyle. He felt that they would have to be isolated from their environment and given a basic education with an introduction to suitable vocational skills. For this purpose, in 1879–80 Grandin asked the federal authorities to help by increasing grants to existing schools and orphanages and by building industrial schools. In the latter, boys would spend part of the day working on the school’s farm and in its shops, and girls would learn domestic arts in the kitchen and laundry. As a result of requests by Grandin and other missionaries, the government authorized the construction of three industrial schools in the west in 1883. One of them, St Joseph’s at Dunbow (near Calgary), was administered by the diocese of St Albert. As far as Grandin was concerned, the signing of treaties made the task of his missionaries more difficult. Once Indians were established on reserves, Protestant clergy were less reluctant to venture out and denominational rivalries heightened. 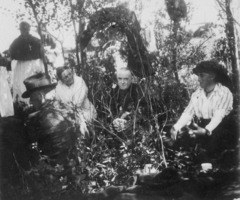 At first Catholics were unable to provide missionaries for each reserve; when they were later sent where Protestants were already established, Grandin alleged that Indian agents, on the advice of Protestant clergy, were attempting to prevent Catholics from building another school or mission on the pretext that the Indians themselves did not want a rival establishment. Grandin claimed that the government had not signed treaties with denominations but with the Indians. Hence the latter must be allowed to belong to the church of their choice and this privilege could not be violated or imperilled by the majority. Closely related to this concern was Grandin’s suspicion that officials of the Department of Indian Affairs were discriminating against Catholic institutions and Indians. 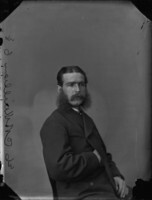 Not satisfied with the verbal assurances of impartiality that he had received from the authorities, Grandin pressed for more formal, written guarantees, and in 1883 and 1886 he went to Ottawa in an attempt to lobby government ministers and obtain something in writing. On 9 Dec. 1886 Grandin finally received a communication from Prime Minister Sir John A. Macdonald* stating that the Indians’ freedom of choice in religious matters would be protected and that the department would not interfere with missionaries in the exercise of their duties. Grandin remained convinced, however, that the department and its officials were not impartial and that the government favoured Protestant missionaries and institutions. One of Grandin’s fondest desires was to create an indigenous, that is, a native clergy. As a means to this end, he sent the two orphans he adopted to the Collège de Saint-Boniface in 1859, but they abandoned their studies. In 1876 Latin was taught to a small number of Métis children from good families in an attempt to prepare them for the priesthood. 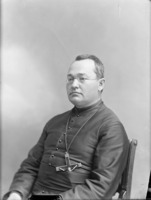 Only one, Édouard Cunningham, persevered, and after further studies in Ottawa he was ordained by Grandin on 19 March 1890, thus becoming the first Métis priest in the northwest. A few years later, in 1897, a dozen children were sent to various colleges and seminaries in eastern Canada but, lacking adequate preparation, they became discouraged and returned home. In an attempt to overcome this problem Grandin inaugurated the Petit Séminaire de la Sainte-Famille in St Albert on 21 Jan. 1900. Grandin’s determination to create a native clergy was not shared by all his missionaries, many of whom tended to regard certain traits among Indians and Métis as insurmountable barriers to a religious vocation. Although European in outlook and orthodox in religious convictions, Grandin nevertheless demonstrated more than usual sympathy for indigenous peoples. He was prepared to make allowances for the particular status and circumstances of native populations in the northwest and would not apply rigidly to them the rules governing admission to the sacraments that were binding on Catholics elsewhere. Acquainted with the Indian character and mentality, Grandin urged his missionaries to avoid excessive severity when dealing with transgressors and to be charitable and forgiving. Prior to the North-West rebellion of 1885, Grandin realized that the Métis in his diocese were suffering, and he made numerous representations to the authorities to alleviate their plight. As the position of the Métis deteriorated and their frustrations mounted, Grandin sought simultaneously to maintain them in a state of obedience and to obtain justice for them from the government. Although he deplored the recourse to arms in 1885 he remained convinced that it had been English-speaking residents who had provoked the Métis to rebel by attempting to steal their lands. He claimed, moreover, that the authorities had overlooked these illegal activities and this disregard had further infuriated the Métis. 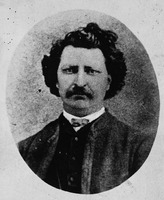 Towards Louis Riel*, Grandin was utterly hostile. He judged the Métis leader a raging madman who, pretending to be inspired by God, had deceived people and forced them to take up arms. After the rebellion Grandin interceded on behalf of the incarcerated and he urged the government to be as lenient as possible. He also was concerned about the material well-being of the Métis who were alienating their lands. Thus he encouraged them to establish themselves in the colony that Father Albert Lacombe* had founded for them at Saint-Paul-des-Métis (St Paul, Alta). Grandin’s missionary diocese was not financially self-sustaining. The largest single source of revenue was the annual allocation from the Society for the Propagation of the Faith in France, but this sum was never sufficient to maintain missions, schools, and orphanages. During his periodic visits to France, Grandin preached in cathedrals, parishes, and seminaries and took up collections for his diocese. In the late 1870s he decided to establish the Œuvre des Écoles du Nord-Ouest. At first he wanted to set up this society in the United Kingdom so that Catholics there could adopt and support Indian children attending school. Unfortunately the Society for the Propagation of the Faith viewed Grandin’s project as a direct competitor and opposed its introduction into Europe. Consequently he was forced to limit his solicitations to North America. He visited eastern Canada and the United States to raise money in 1887 and again in 1888. In 1901 he would make a direct appeal to the clergy of Ontario and Quebec. 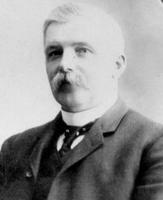 Under Grandin’s direction, the missionary frontier of the diocese of St Albert was extended and consolidated. Individual stations enlarged their sphere of operations by establishing satellite posts, while strategic missions such as the ones at St Albert and Lac la Biche were expanded and were able to supply other places with farm produce and animals, sawn lumber, and flour. New work was undertaken among the Blackfoot of what is now southern Alberta, beginning with periodic visits by Father Lacombe in 1865 and more extensive missions to wintering camps. Permanent posts followed: Our Lady of Peace near Calgary in 1872, Brocket in 1881, Cluny in 1882, and Stand Off in 1889. Schools, orphanages, and hospitals, when sufficiently attended, were placed under the direction of female religious communities such as the Sisters of Charity of the Hôpital Général of Montreal. Development and settlement, however, were also taking place in the heart of the diocese, and Grandin had to provide for the spiritual needs of a cosmopolitan Catholic population in growing urban areas such as Calgary and Edmonton, in mining centres such as Lethbridge, Bankhead, and the Coal Branch (a group of communities southwest of Edson), and in emerging agricultural districts. Cognizant of the numerically weak position of Catholics in the northwest and the spoliation of French and Catholic privileges in Manitoba and the North-West Territories, Grandin attempted to promote immigration from Quebec and from Catholic countries in Europe. In 1899, for example, he urged the bishops of Quebec to persuade people leaving the province that they should go to western Canada rather than to the United States, where they faced certain assimilation. He encouraged missionary-colonizers such as Abbé Jean-Baptiste Morin*, who laboured in the Edmonton region to settle French Canadians and Franco-Americans. During his travels in Europe Grandin also attempted to recruit Catholic immigrants. His resources were limited, however, and his efforts were never sufficient to alter the minority status of the French and Catholic populations in the west. Grandin had assumed episcopal office with great reluctance but he was nevertheless a prudent and efficient administrator who endowed his diocese with parishes, schools, hospitals, orphanages, and a minor seminary. He also obtained the services of secular clergy and female religious communities to second his efforts and support diocesan institutions. In keeping with his timid character, he was not an assertive bishop and this reticence is evident in his relationships with fellow prelates. In the conflict with Faraud over the administration of the Lac la Biche mission, for example, even the superior general of the Oblates said that he lacked the determination to protect his own interests. Grandin demonstrated great skill, however, in assessing the potential of individuals who served under him and making optimum use of their talents. Grandin had suffered from ill health since infancy, and the arduous labour, frequent voyages under trying conditions, and poor diet of a missionary in the northwest undoubtedly caused a further deterioration. He suffered from severe earaches, abscesses, and infections, and as early as 1875 feared the loss of his hearing. Despite medical attention in France, the problems persisted and were accompanied later by internal disorders and haemorrhages. As a result of his age and health, Grandin had asked to be relieved of his office of bishop and responsibilities as vicar of missions. Rome refused to accept his resignation and sometime later, in 1897, appointed Émile-Joseph Legal* coadjutor bishop of St Albert. Grandin’s health continued to deteriorate but he exercised his duties until his death on 3 June 1902. In 1929 the canonical investigations were begun for his beatification and in 1966 he was declared venerable. A volume of Grandin’s journals has been published as The diaries of Bishop Vital Grandin . . . , ed. B. [M.] Owens and C. [M.] Roberto (1v. to date [1875–77], Edmonton, 1989). Arch. de l’Évêché de Prince Albert, Sask., [V.-J. Grandin], “Mémoire de l’évêque de St-Albert sur ses difficultés avec le département indien.” Arch. Départementales, Mayenne (Laval), État civil, Saint-Pierre-la-Cour, 8 févr. 1829. Arch. Deschâtelets, Oblats de Marie-Immaculée (Ottawa), H 5102.G75L, nos.8, 16, 68; H 5102.G75M, no.1; HE 2223.T12Z, no.3; HPK 2000.N82R, no.27; L 2381.A33R, no.6; LE 3.M14R, no.16. NA, MG 26, A: 188067–68, 204290; RG 10, 10, file 43943; 3708, file 19502. Provincial Arch. of Alberta, Arch. of the Oblates of Mary Immaculate, Prov. of Alberta-Saskatchewan, 71.220, items 5404, 7085. P.-É. Breton, Vital Grandin, o.m.i. : la merveilleuse aventure de “l’Évêque sauvage” des prairies et du grand nord (Paris et Montréal, 1960). Gaston Carrière, Dictionnaire biographique des oblats de Marie-Immaculée au Canada (3v., Ottawa, 1976–79); “L’élévation du père Vital-Justin Grandin, o.m.i., à l’épiscopat,” Oblate Life (Ottawa), 32 (1973): 100–34, 159–91. Claude Champagne, Les débuts de la mission dans le nord-ouest canadien: mission et église chez Mgr Vital Grandin, o.m.i. (1829–1902) (Ottawa, 1983). R. [J. A.] Huel, “La mission Notre-Dame des Victoires du lac la Biche et l’approvisionnement des missions du nord: le conflit entre V. Grandin et Mgr H. Faraud” (paper presented at the first Oblate symposium, Univ. of Alta, Edmonton, 1989). Martha McCarthy, “The founding of Providence Mission” (paper presented at the first Oblate symposium, 1989). C.-J.-E. de Mazenod, Lettres aux correspondants d’Amérique . . . (2v., Rome, 1977). A.-A. Taché, Vingt années de missions dans le nord-ouest de l’Amérique (nouv. éd., Montréal, 1888). M. B. Venini Byrne, From the buffalo to the cross; a history of the Roman Catholic diocese of Calgary (Calgary, 1973). Raymond Huel, “GRANDIN, VITAL-JUSTIN,” in Dictionary of Canadian Biography, vol. 13, University of Toronto/Université Laval, 2003–, accessed April 22, 2019, http://www.biographi.ca/en/bio/grandin_vital_justin_13E.html.